A vacation to New York City doesn't usually involve a lot of rest and contemplation. However, make the trip to the Morningside Heights neighborhood of Manhattan, and you can find both at the General Grant National Memorial. Visit the General Grant National Memorial, at Riverside Drive and 122nd Street, on a sunny day, and you’ll see the granite edifice bathed in sunlight, the classic structure perched on the historic Hudson River in Riverside Park. Walk past the eagles at the entrance to get inside, and you'll be enveloped in calm, followed by a sense of awe and melancholy. This is by design; John Duncan, the architect of the structure, wanted “to produce a monumental structure that should be unmistakably a tomb of military character.” He succeeded. As your eyes travel upwards, notice that the walls extend towards yellow-tinted skylights. These skylights make even the bleakest day shine a little brighter, as they bathe the memorial with a honeyed glow. Also visible at this level are relief sculptures and murals of Grant's greatest military campaigns. The artwork continues into the two reliquary rooms, marking battles that Grant participated in or led. The two complimentary murals highlight how tireless Grant was—he seems to have had a hand in every battle of the Civil War. Head back to the center of the tomb, and look down. 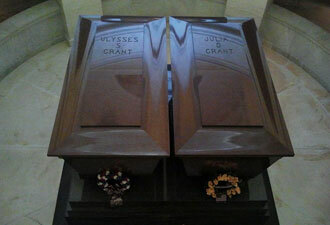 The two red granite sarcophagi in the crypt area are the final resting place of Grant and his wife, Julia. Grant and Julia shared a passionate, lifelong love affair, and seeing these two side by side is a touching reminder that Grant was at his core an unassuming family man. Down at the crypt level, you'll see the busts of generals Sheridan, Ord, McPherson, Thomas and Sherman—all of whom keep eternal vigil over the couple. Each year on Grant's birthday, April 27th, a special ceremony with military honors and a wreath laying takes place. 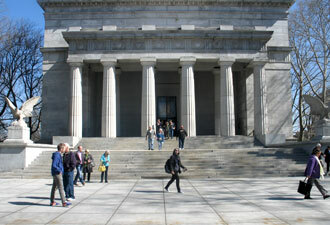 Come by General Grant National Memorial to pay your respects to a great man, and enjoy this awe-inspiring structure and the natural beauty of New York City. 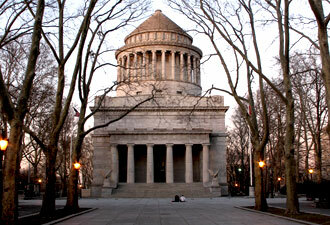 **For those who can't take the suspense—No one is buried in Grant's Tomb. Grant and his wife are above ground, so they are entombed rather than buried.